Risk appetite fell last week as government bond yields rose. Yet, Citi's Bear Market Checklist suggests it is still too early to call for the end of the equity bull market. 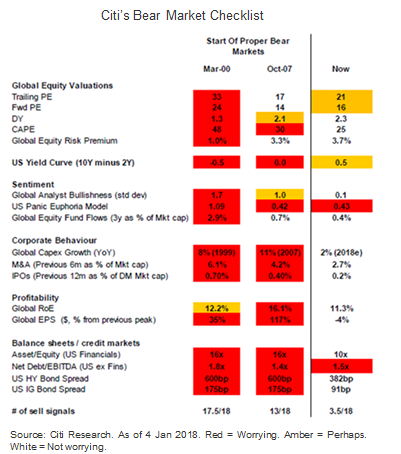 Citi's Bear Market checklist compares current global market variables to those before previous major downturns. Currently, 3.5 out of 18 factors are flashing "sell" compared to 17.5 in 2000 and 13 in 2007. See chart. This does not mean that investors should be complacent. Given the flattening yield curve earlier, Citi analysts recently changed the US yield curve indicator to amber. They also changed the US Panic Euphoria Model Indicator, a sentiment indicator, to red as the indicator reached euphoria recently, suggesting near term caution for US equities. While short term market corrections may occur, the checklist currently suggests that corrections may present rebalancing opportunities. Diversifying globally across multiple asset classes remains one of the most effective way to lower risk in portfolios over the long term. Citi analysts' favored equity markets are Europe and the Emerging Markets (EM). Over in Europe, an improving economy should boost earnings and equities look cheap, especially against bonds. EM equity valuations look reasonable and US dollar weakness is expected to boost earnings momentum. Investors expecting bond yields to climb further can also consider the global financials sector which tends to outperform in a rising yield environment.